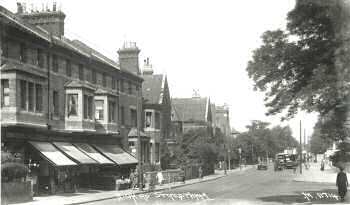 Streatham High Road looking north towards Streatham Congregational Church, seen in the centre left of the picture. Bladon Terrace is in the left foreground (between Barrow and Lewin Road), before it suffered extensive damage in World War II from a flying bomb. The corner site is now marked by a prominent advertising hoarding. Facing opposite is the garden of the United Service Club, formerly 'The Chimes', and the Streatham War Memorial. The house was demolished and became part of Albert Carr Gardens estate. 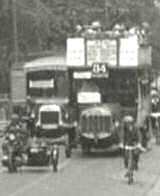 Note the motor cycle and sidecar in the distance followed by the No 34 bus.